I've been training for almost two years in what I like to consider a veritable parkour paradise, one of few in NJ. People near or in Monmouth and Ocean counties - this is for you guys. More people need to know about this place. The location itself is right on the mouth of the Manasquan River, right on the beach where it meets the inlet. Aside from the absolutely stunningly unique location above the open ocean on the beautiful Jersey coast, the training zone has just about any possible combination of surfaces you could ever want as a practicing traceur. Allow me to make this clear, however; the zone itself is rather unforgiving - any slip in technique is extremely likely to result in injury. Like all aspects of parkour, know your limits here. There are two very usable sub-locations here for training techniques. The first area you'll see as you approach the location from the street is the usual vault/roll area (EDIT: Also, across the street from the small snack shack named "Carlson's Corner" is a fun little white concrete wall for vaults/tricking). The gazebo will be just up the stairs that lead from the inlet-side pathway. People learning rolls should use the sand around the gazebo and get a good feel for the general form they prefer so they can ease into rolls rather than being forced to learn on much harder, unforgiving surfaces. Vaulting out of the gazebo into the sand or off of the ramp leading up to it from the street, as well as vaulting the white plastic rails on the pathway leading up to the beach through the sand, are usuals for my particular group. Precision jumps can be practiced anywhere on the jetty itself (the jetty is the long man-made formation of boulders leading out to the very end of the inlet). The Beach Patrol here actually encourages safe parkour - by that, they just don't want any bystanders getting hurt. If you can pull that off, they're more than happy to watch you train, and they'll sometimes even gather crowds for you. Once you begin your trek to the end of the rocks, the real fun begins. There, you'll find a large concrete platform with a tower installed on it, and surrounding the platform is the actual PK paradise. 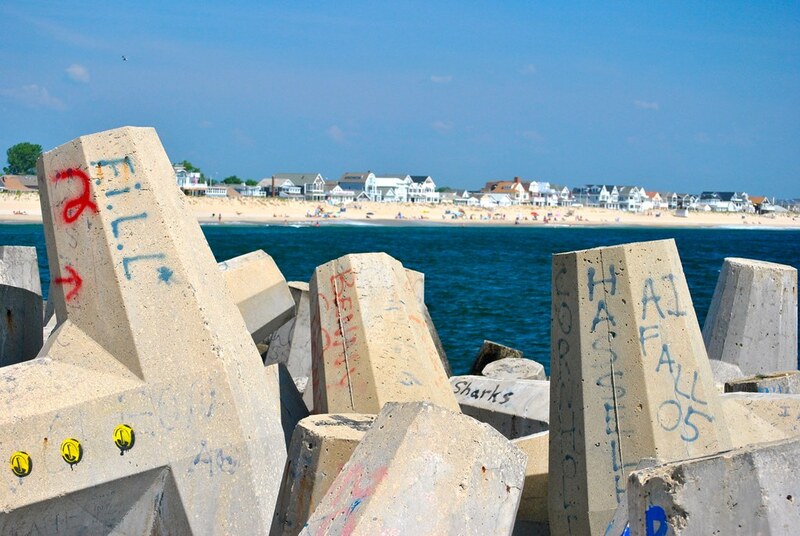 These giant concrete jacks were haphazardly placed by the U.S. Army Corps of Engineers many, many years ago to prevent the self-damming and erosion of the Manasquan Inlet. As traceurs, we've found them to be incredible training zones. WHILE THIS MAY LOOK LIKE A GREAT PLACE TO PUT YOUR SKILLS TO THE TEST, I can not stress enough the importance of focus while you're out on the T-Rocks. Stay up high and away from the outer rocks, as they're generally very lightly coated with water, which instantly negates almost any grip you could possibly attain with shoes or bare feet. Take the time to plan your run carefully, pick routes that are safe and secure. ALWAYS bring a buddy with you when you leave the main platform - if you go down and nobody sees or hears you... Well, that's not going to end well. The buddy system should be observed at ALL times. Do NOT take unnecessary risks. The jetty will punish you for doing so, and it will not be forgiving. This is a location where almost any aspect of parkour can be trained, but it comes at a price - general safety. I must stress that only those who have a good sense of self-control and body awareness attempt anything on the end of the jetty. Local authorities have no problem with people on the T-Rocks, and have no desire to remove traceurs. The end of the jetty itself is a place many beachgoers visit daily, and Hell, we even wave at the Coast Guard as they pass by on patrol or calls daily. Speaking of which - the closest Coast Guard post is no more than 500 Meters up-river, so if something does actually happen to anyone out there, you can expect rapid response. Listed below are some general attributes about the location as well as additional info and directions to it. Trainable Movements: Vaults, rolls, precisions, slides, and landings (beach-side); vaults, tic-tacs, easy wall-runs and combos, precisions, balance, spider-walking, landings, kips, cats, muscle-ups, and more (end of The Jetty). Recommended Gear: Adequate shoes for parkour, gloves (preferably motocross or biking - the ledge surfaces found at the end on the Jetty weren't designed for human contact, and can slice your hands - we all recommend you use gloves until you know your way around the sharp stuff), and plenty of water to keep hydrated. Local Traceur Meetings: Every Thursday at 3:30PM; Every Saturday at 12:00PM. The local traceurs are generally at this location most days, weather permitting, but Thursday and Saturday are the two days we make sure we go at those times. Drop in any time, and we'll be happy to teach what we can if you want any instruction! All skill levels welcome, of course! Look for the APK symbol on the area around the gazebo and jetty to know you're in the right place. Contact: If you'd like more info, please feel free to call or text me at 732-284-0723. Or, add me on Facebook as Carl Lepis, and introduce yourself! The more traceurs we can cultivate in our area, the better we'll all become as a whole with our training! I look forward to seeing some new faces! And Hell, if you can make the trip from wherever you are (for you far-away-ish people), I highly recommend it. You won't be disappointed in the least. count me in! I'll be there next Saturday.